Injured Patient: Thank you, in the name of Jesus. Miguel Leon: In the name of Jesus? Miguel Leon: I prefer it in the name of you and me? OK, so here we go. 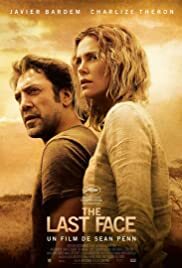 "The Last Face" premiered during Cannes last year and it got bashed by critics and even booed at. When I heard about that I couldn't really believe it. 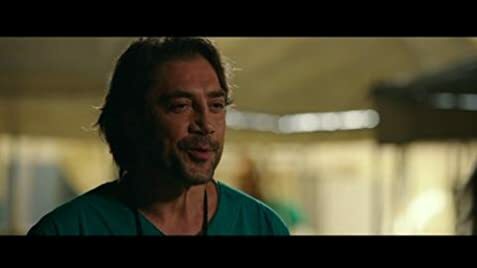 I mean, a film directed by Sean Penn starring Charlize Theron and Javier Bardem being that bad? It got me curious to watch it. Because I needed to know if it was getting fair reviews or not. It turned out to be a long wait, because It took a year for it to finally come out in other countries. I went in with an open mind. Ready to give it a deserving chance like every movie does. Well, now after seeing it I understand where the problems lied. Although, I must say right off the bat that it's not completely terrible... But it does get messy. What I didn't like was that it got exaggerated and tried to force the emotion rather then earning it. The romance was predictable and typical. It goes through all the expected beats of "Will they be together or won't they?" The movie uses narration and I thought it was unnecessary. It would have worked better without filling the audience in on the plot so often. I think people can figure it out perfectly well on their own, because it just added to the melodrama. Which was annoying at times with them over sympathizing the story and dragging out moments. It was good whenever it just calmed down and showed some realism. The premise itself is fine. Doctors going to Africa to help people in need. I understood the overall message of mankind's goodwill. The hospital/doctor scenes had some tension to them and they felt very realistic. There's also a lot of gruesome and horrific imagery of people's misfortune in Africa which was affecting. Those were the parts that stuck with me. The characters were able to convince me in many scenes, but unfortunately not the entire way through. It's sad, because Bardem and Theron looks to have put so much effort into this. Like I said, the story of them being doctors and traveling in Africa to help people was fine. It was the romantic story that dragged on and felt clichéd. They should have toned it down and made the entire movie more realistic and down to earth. I was able to see glimmers of what could have been really good touching moments. Instead we get too much melodrama with musical soundtrack telling you exactly how to feel instead of the story itself making you feel something. Although there was some music I liked in it: The local African songs and the Piano tracks towards the end. There are scenes that are good. Scenes that feel like real life stories with heart to them. The thing is that we get so few of them spread across the movie. I was never able to truly appreciate those scenes so well because the following part would often drag it down again. Without spoiling anything, the final moments were finally able to get some emotion across. The ending was my favorite part. It made me finally care for what was going. It was a little too late. But hey, at least it was something. The movie leaves you reflecting on life a little bit. But not nearly as much as I'm sure the filmmakers wanted. It does, however have its moments that work. And for that I will give it points. The movie is not nearly as awful as some people are making it out to be. It's just average. If you are looking for something to pass the time with, then this will work fine. Just don't expect much. It's watchable, but nothing memorable.